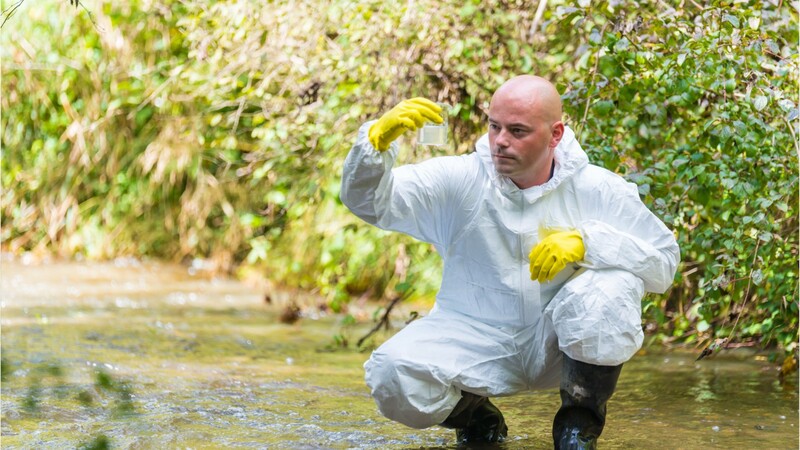 Working to keep ecosystems safe and protect public health, environmental science and protection technicians observe the environment and investigate sources of pollution and contamination. In consulting firms, these technicians help their clients keep an eye on environmental impacts and comply with regulations. They develop cleanup plans for contaminated sites, and recommend ways to eliminate pollution. Government environmental science and protection technicians inspect businesses and public places, and follow up on environmental or health-related complaints. They may perform environmental impact studies of new construction, or evaluate sites that could contaminate the environment, such as abandoned factories. When employed by testing laboratories, technicians collect and track samples, and perform tests. They may also gather samples in the field. Fieldwork is often physically demanding, including long hours walking, carrying heavy equipment, and frequent bending and crouching to set up and monitor equipment. Protective gear such as hardhats and masks is required in some settings, and weather conditions can be difficult. Environmental science and protection technicians typically work full time. Travel to meet with clients or for fieldwork can require additional or irregular hours. Most jobs require an associate’s degree in environmental studies or a related technology, such as remote sensing or geographic information systems, although some positions require only high school, and others, a bachelor’s degree. See more details at O*NET OnLine about environmental science and protection technicians, including health. Environmental Science & Protection Technicians, Including Health by U.S. Department of Labor, Employment and Training Administration is licensed under a Creative Commons Attribution 4.0 International License.